If your client is experiencing times of distress outside of therapy, it is helpful for them to have a strategy in place to help alleviate the distress. This can include both mental strategies such as meditation, deep breathing, talking as well as physical self-soothing strategies such as creating art, journaling and engaging in comforting affirming activities. 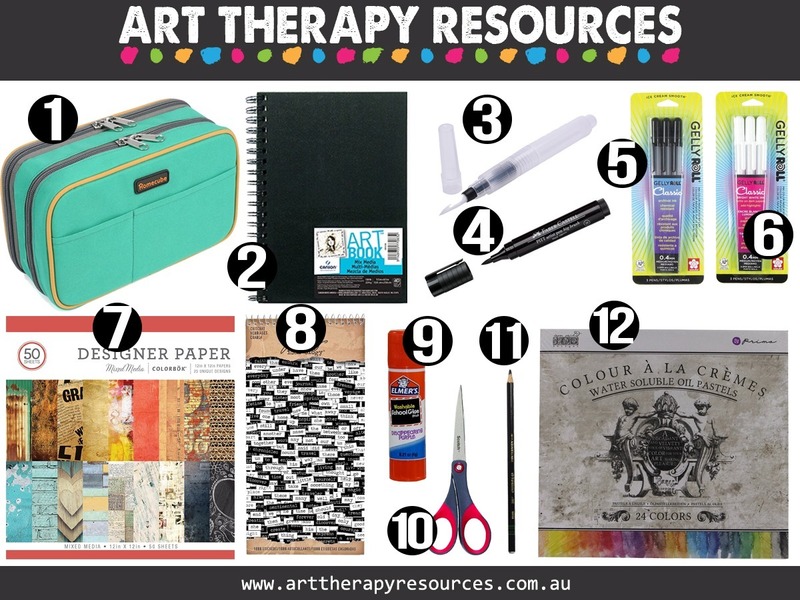 It is helpful for your client to have an art therapy supplies kit that they can use when seeking coping strategies through art therapy activities. A kit will contain everything in one place and reduce the effort requires for your client to implement self-care. Self-care is provided for your client by your client. Your client identifies their own needs and can use a number of activities to provide themselves with comfort. The activity should provide a positive physical, mental or emotional boost that will help them reduce any negative or distressful feelings. Giving yourself comfort and care. Self-care should aim to reduce anxiety and improve your client’s mood. Clients who are experiencing a negative view of themselves can often feel guilty for undertaking self-care activities and feel they are indulging in selfish activities. It is important for clients to understand the benefits of self-care for themselves and other interpersonal relationships. A good metaphor to explain to clients is when the flight attendant on a plane tells you to put your mask on first before assisting others. Your client should understand that if they don’t take care of themselves through self-care, they will not be as effective in other parts of their lives. Engaging in art therapy activities can help distract your client from ruminating on a problem or engaging in impulsive actions. Distracting activities help give your client some respite from negative thinking patterns. It also helps your client simply pass time until their emotions become stable again. The act of your client completing a task such as an art activity may also provide them with a positive reinforcement of their ability to create art as well as overcome emotional distress. Your client may be feeling pressure from having to resolve a problem they are experiencing. Using distraction techniques such as art activities may help alleviate some pressure that your client may be experiencing. Ultimately distraction techniques are a temporary reprieve, however, they can be useful in breaking negative patterns of thinking and behaviour for your client. Reframing beliefs can help your client turn a perceived problem into an opportunity or see an impossible situation develop into new possibilities. Reframing is a popular concept used in CBT, however, if your client is struggling to work through the cognitive elements of a problem, art therapy is an effective method to process negative feelings. In addition to the process of art making, art therapy activities provide your clients with a tangible outcome of their mental efforts through completing a piece of art. The use of art therapy allows your client to reduce the pressure of formulating verbal statements around thoughts and instead use art therapy activities to help reframe negatively held beliefs and emotions. Art therapy can be effectively used in gratitude exercises which can help your client explore and appreciate the positive aspects within their lives, despite negative emotions they may be experiencing. Developing awareness can help your client clarify the specific emotions they are experiencing. The concept of mindfulness is useful when attempting to achieve this awareness. Through art therapy activities, your client is able to undertake a process of mindfulness by reducing feelings of overwhelm and pay attention to specific feelings. Art therapy activities can help facilitate a connection through mind and body so that your client can identify an emotional feeling and develop awareness of how this feeling may be presenting through their body. 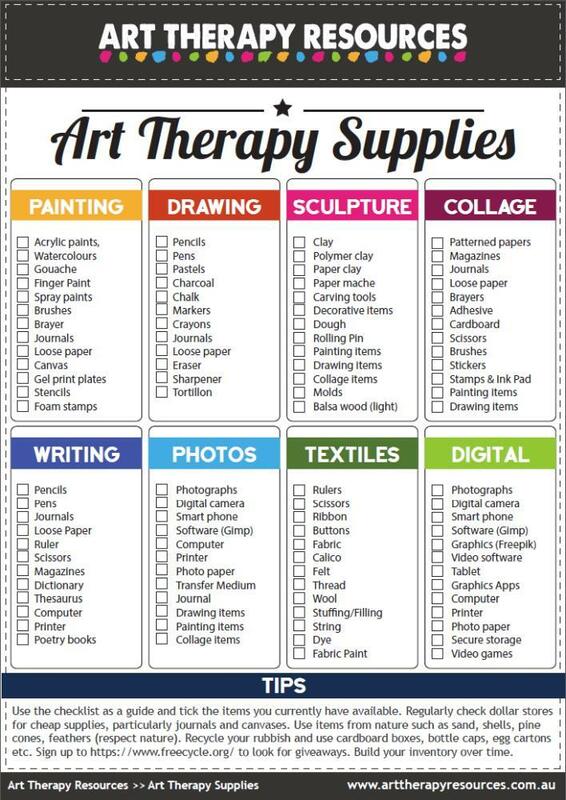 Developing an art therapy supplies kit can be useful for your clients both in and outside of your therapy practice. Your client may have developed an affinity with specific art supplies in your studio that they like to use in art exercises. 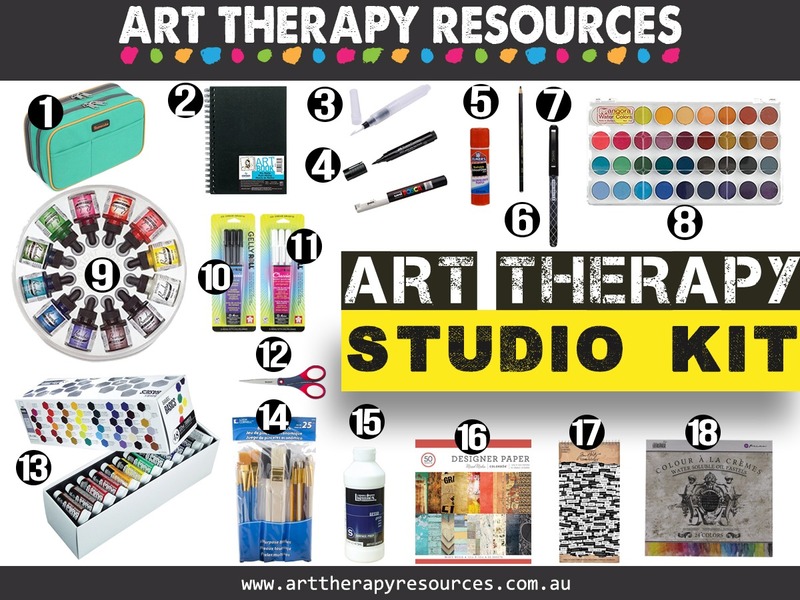 While you may not have the number of supplies available to create individual coping kits for each client to use as their own, you can help them devise a list of supplies that they can easily collate when entering your studio. Alternatively, you can store your studio supplies into section such as painting supplies, collage supplies, clay supplies etc. Storage and organisation of supplies into kits can help save time in therapy sessions where you want your client to be focusing on therapeutic benefits and not be distracted by searching for supplies. For clients who are resistant to therapy, this searching process can be used as a strategy of avoidance. You may want to encourage your client to create their own art therapy coping kit for use in art activities outside of formal therapy sessions. 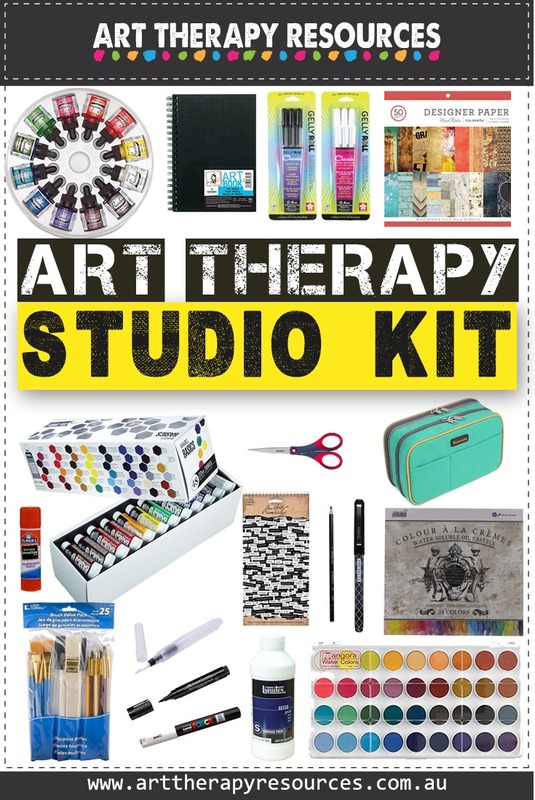 To make this process easier you can provide useful information to your client on how to create an art therapy kit. You can provide this information with a simple handout or direct them to a page on your website where you offer the advice for free to all readers. Creating a portable kit will allow you to create art anywhere which is very useful when you find yourself with a significant amount of waiting time. While you may not be actively engaging in resolving psychological issues while waiting in the doctor’s office, creating art will help provide useful self-care techniques that can help reduce feelings of impatience. If you find yourself sitting in the dentist waiting room, simple art exercises can help alleviate anxiety that you may be experiencing about being in the dentist chair. Portable kits are best kept as dry kits by using pens, pencils and paper. This will reduce clean up required and avoid potential supply spills. Dry portable kits are good for shorter visits out of your own place, however, if you are taking a shorter holiday you can extend your portable kit to include some wet art products also including small watercolour palettes. As part of your portable art activities, you could create smaller artworks and then use these smaller artworks to create a larger piece when you are in your own art space. Below we’ve collated a basic portable kit that includes mostly dry products with a few wet products that are easy to use outside of the studio or home. A studio kit has no boundaries other than storage and cost. It’s advisable to keep an art supplies kit to a reasonable size because too many supply options can sometimes result in creative paralysis. Sometimes a restricted amount of supplies will keep the focus on creating instead of the decision making process around choosing art supplies. Collecting art supplies can be an enjoyable experience itself, and can facilitate an attitude of experimentation that helps keep our minds flexible and open to new things. If your client is interested in purchasing supplies, you can advise them to consider the supplies they like to work with most in therapy. This can help direct them to the types of supplies to purchase. They could also start with a basic portable kit and expand the supplies from that starting point. Download the FREE art supplies checklist for a comprehensive list of items you can include in your studio. Below we’ve collated a basic studio kit that includes both wet and dry products. This kit builds upon the previous portable kit and includes items that can be purchased in addition to the portable kit. SIGN up to Download the FREE art supplies checklist for a comprehensive list of items you can include in your studio.